Finally tired of counting beads of you medicine? Tired of starting over and over again? Tired of dropping beads from the table so cats and dogs are already also on your drug? Tired of refilling the beads from the table back into the capsules and loosing beads? As I am still on CYMBALTA and tapering down. I use 30 mg capsules which contain 290 (+/-) little beads here in Germany. If you live in the states or somewhere else make sure to count (only ONCE) how many beads you have in your capsules. 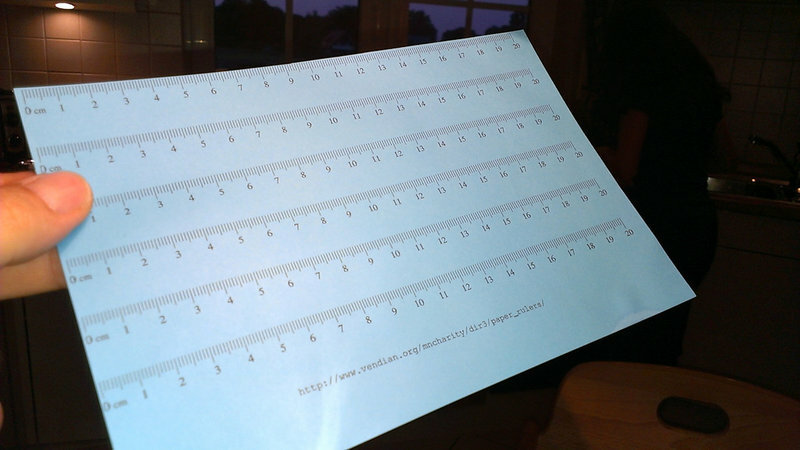 Print yourself a sheet of paper with rulers on it! 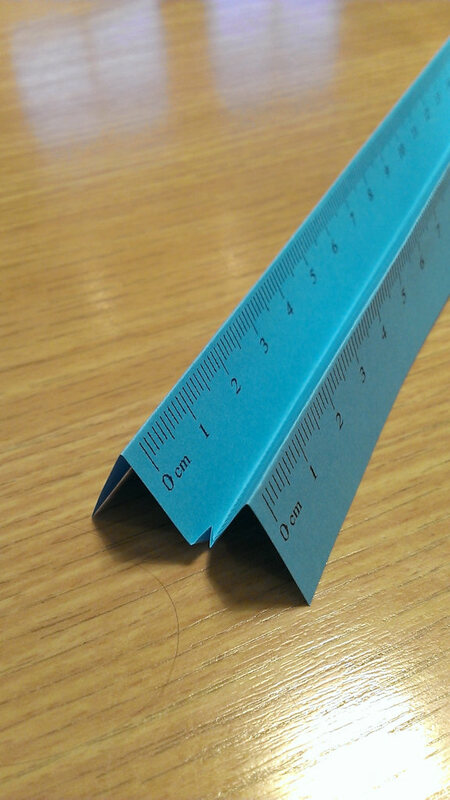 You can get different versions of rulers on this site for free http://www.vendian.org/mncharity/dir3/paper_rulers/. As we use cm instead of inch in Germany I personally use the file rules_cm_20cm.pdf but you can make your own choice. Print the downloaded pdf with your rulers on it on colored paper (I use blue) to have a nice contrast to the white color of your beads. Make sure your printer settings are correct to get the exact proportion when you print the rulers on your printer. Cut a piece of the printed paper so you get a sheet with 4 rulers on it. Now fold this piece of paper to get a nice little chute that can be placed on a table without tipping over to one side. 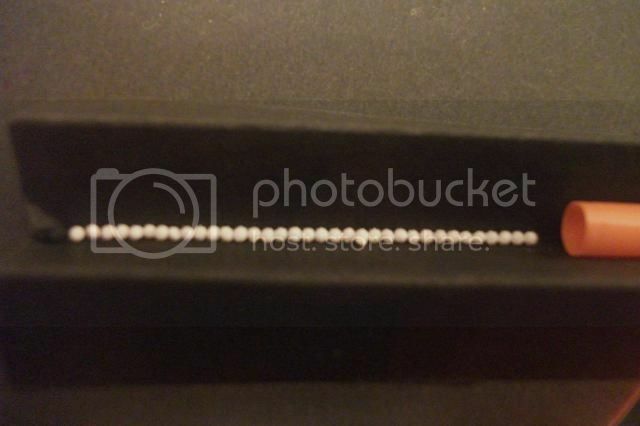 Also make sure you fold a little bend at each end of the chute to avoid loosing beads. Now open your capsule that you use and pour some beads into your chute. Make sure to have the little rascals exactly in one row and not piled up here and there. Done so you can exactly determine how many beads you have on 1 cm (or inch). 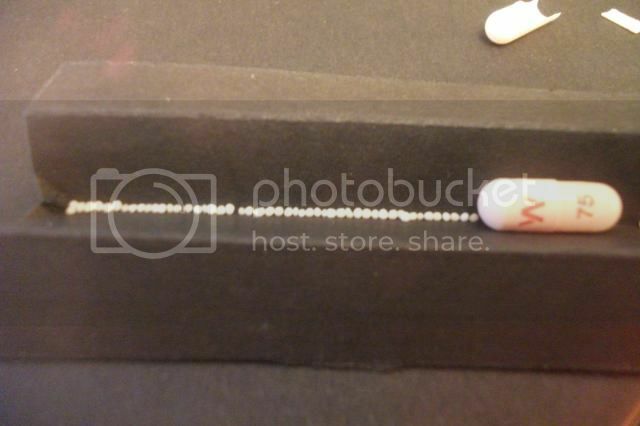 Me using 30 mg capsules of CYMBALTA beads - I have exactly (always the same) 11 beads on 1 cm. Here we are – no counting anymore – MEASURE your beads! As I said I have 11 beads on 1 cm, I now know that e.g. 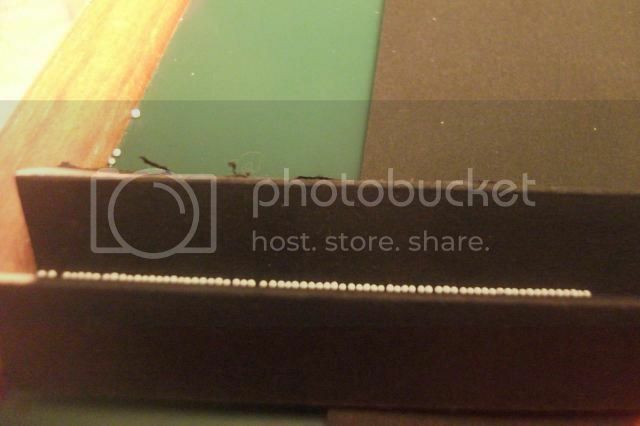 8 cm of beads in a row are exactly 88 beads. You can now easy calculate how many beads you have to measure when reducing the content of your capsule. In my case (290 bead are 30 mg) 5 mg has a length of 4,4 cm. So when I reduced my dosage by 10 mg the first time I measured exactly 8,8 cm in my chute. If you have measured your beads open one side of your paper chute and first pour the rest of the beads into a different cup. 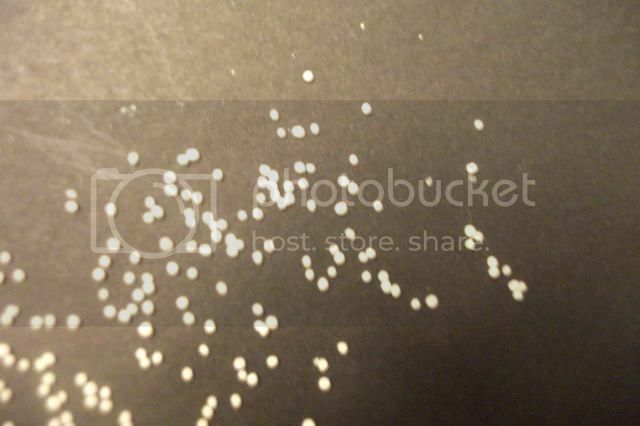 Then fill the exact amount of measured beads into a new capsule. As you see I use clear capsules to see the content. Let me know if this was helpful to you and what you think! Best wishes and lots of health to you! Excellent idea Sly, those little beads are a pest to count, my capsules have 400 of the things! Welcome to SA, the best place to be for support while tapering and withdrawal. Sounds like a useful method. I've never tapered with beads myself but I would be interested to hear how our bead-taperers feel about this and how well it works for them. Could be a good addition to the tapering tool set. sly, have you verified the accuracy of your measuring method? It seems to me the beads would slide around some, leaving space between them. well you have to make sure with a little shaking and moving the bead in the chute (like gold washing ) that the beads are not piled up or leaving space between them. Sometimes I use a letter opener or knife to move them a little. But I am really satisfied withi this method. I varified the method by counting beads after measuring and it always was accurate. As I said I have 11 beads on 1 cm - ALWAYS. So currently I measure 9,7 cm for my current dose of 11 mg in the morning and 11 mg in the evening. I use an EXCEL sheet which I could also offer here. The 9,7 cm with beads are 106 beads. So for me to measure the 9,7 cm, shake the chut and correct the beads then fill them back into a capsule, maybe takes me - lets say max. 1 minute. HOW LONG would it take people to COUNT 106 beads floating around on the table !!!! 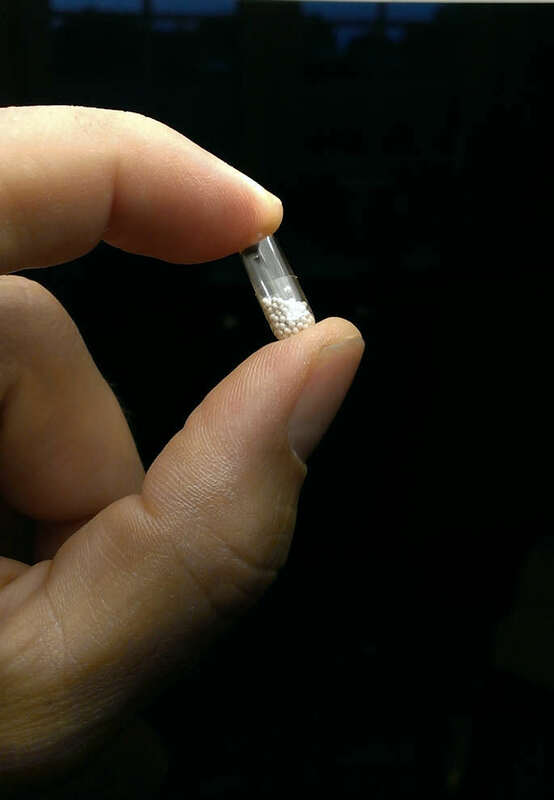 And another BIG advantage is that you can pour the beads directly into the capsule without loosing a single bead. I thought about making a movie and post it on youtube but didn't do it so far. If you have more questions and would like more pics or my EXCEL sheet let me know. See my sheet. This is in german but I could do an english one too. sly, this might be perfectly fine. People can check the accuracy of their measurements against the information you've given. Thank you for developing this method and explaining it. yes I think the method is really a very practical one - AND ITS FOR FREE! You dont' have to buy an expensive scale. Print a coloured piece of paper fold it - done. I use it and I think it makes tapering much more easier and you don't have to worry about loosing beads and how to get them back from the table into the capsule. I am very happy that maybe I helped some people in tapering there med. My dream would be that this method would make it into the official TAPERING section in this forum as a PINNED thread! Has anyone tried Sly's method for measuring beads? Please let us know how it worked for you. If you have any questions about this method, please post in this topic and sly will answer them. I've spent some time today experimenting with Sly's technique. This is what I've found with the meds I have. Venlafaxine EFFEXOR, I would not recommend anyone to even attempt this, the granules are so uneven in size. beads at the lower doses, from my own experience, when down to the last few beads uniformity is ESSENTIAL. Venlafaxine generic RODOMEL is the one I have now. even the tweezers, making the whole experience of trying this a bit frustrating. I couldn't imagine doing it every day. when I taper the omeprazole, definitely. I took some photos along the way. The photos are too big to upload so I need to sort that out. Watch this space. EFFEXOR Uneven some flat no uniformity. OMEPRAZOLE, easy to handle, uniform round beads. Would work with Sly's measuring technique for me. so easier to see than by eye. EFFEXOR there was no dust on the card, everything in the picture is from the capsule. My conclusion is that Sly's method could be good for some but not for others, It all depends on the beads. couldn't have managed it anyway with those little blighters! Stellar experimentation, mammaP. Thank you. It passed a few hours and I actually got into it which is great because I still have little concentration. the way they are made now. thanks for your experimentation my method with other meds. I can only recommed it for CYMBALTA because the beads are all the same size. 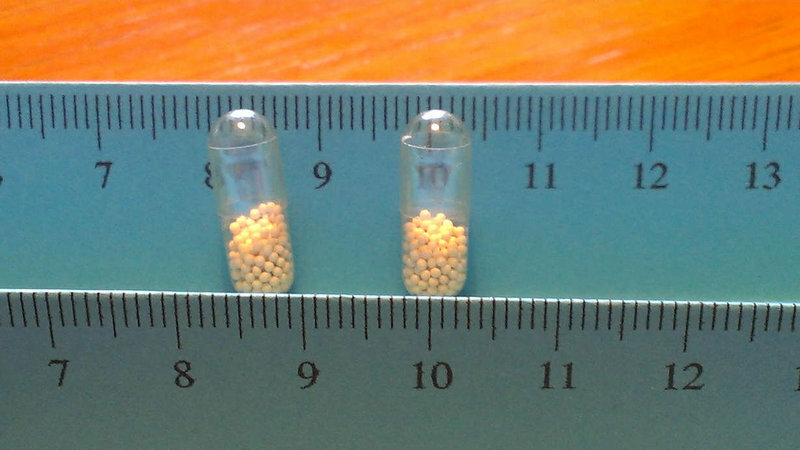 If you have a medication that has beads with different sizes the method should not be used but in that case COUNTING BEADS should also NOT be used. In that case you probably really have to buy a scale for micro amounts. So my method really replaces only countig beads! 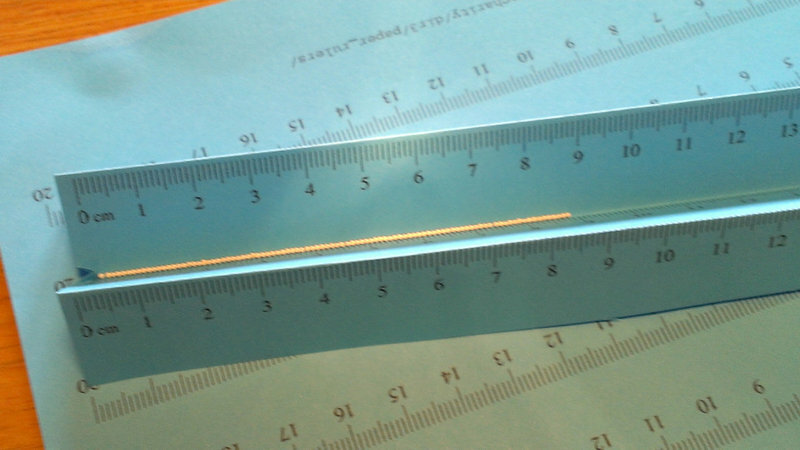 I also recommed to download ruler paper from http://www.vendian.o...3/paper_rulers/. Thank you Sly for such a GREAT method of using the ruler! I will do this soon! I used to count the beads; no more! One IMPORTANT question though...I hope you can answer. You mentioned that you had "slight tinnitus" when taking the Cymbalta. I too have the tinnitus, but more pronounced. When you finally ended your taper, did the tinnitus fully cease??? Much thanks, AnthonyO. This may sound a bit off the wall but I was off the wall when I did it. When I was counting in my attempted taper... I sorted the beads and was I thought at one point close to figuring out a ratio...lol... I was not thinking too well at the time but thought surely there would be some rational to the different sizes... then my plan was to divide the correct amount of larger and smaller beads to this "ratio" I would figure out and take the same ratio. Trying to go back effexor made me extremely ill so I never did get to test my off the wall theory. When I figured out there were different numbers of beads in a capsule my great expectations of scientific clarity and precision and integrity kind of flew out the window. It did not cross my mind at the time that it may all work out to be the same weight... I did not have a scale and so do not know if the contents of the capsules if measure is always precise or if they are different weights too. If they were different weights I guess my loss of faith would still hold ... actually my faith was blown out of the water by the first 6 months of cold turkey. I no longer care if the capsules weigh the same but some of you may want to check it. If you are still here...Thank you Sly for this method of ruler counting on the medication decreasing. It is an amazing scientific method. A WHOLE LOT better than counting hundreds of spheres each day. Kudos!